With the substrate now complete the artefact is now ready for gilding. 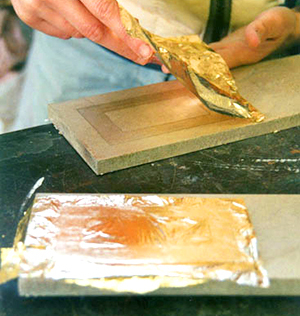 In essence the process of gilding involves the application of a thin, smooth coat of glue called ‘gold size’ to which the metal leaf is applied. 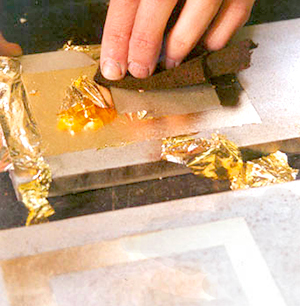 There are two types of gilding, which are defined by the type of size used to affix the leaf. These are water or oil based size and hence the term water or oil gilding. I use both these techniques depending on the finish required. Once the size has been applied you have to wait for the size to cure (dry) until it feels tacky to the back of your hand. This time window varies according to the type of size and room temperature. Having covered the artefact with the metal leaf it must be burnished to the required lustre. This is carried out using an agate burnishing stone tool or soft fabric. There is a multitude of alternative ways of giving an appearance of gilded metal leaf but non-come near to the real thing. The other benefit is that all the qualities of the leaf can be used to effect. 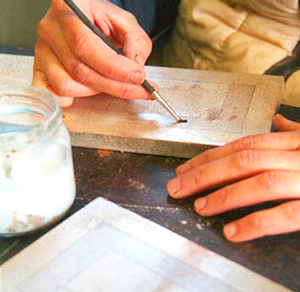 These include tarnishing or rubbing gold and reflective mirroring effects and etching.